It’s only in the past few years that I’ve been introduced to Burmese food, and I wish that the Bay Area had more restaurants outside of San Francisco offering this delicious but underappreciated cuisine. For those in the Peninsula, there is Mingalaba restaurant in downtown Burlingame. They’re always busy, and for good reason. During my last visit, I started with the lap pat dok, or tea leaf salad. I devoured it before remembering to take a photo, but believe me that this mixed salad of Burmese tea leaves, tomatoes, cabbage, dried shrimp, fried garlic, sesame seeds, peanuts and yellow split peas is incredible. For my entree, I tried Mingalaba’s house special noodles. 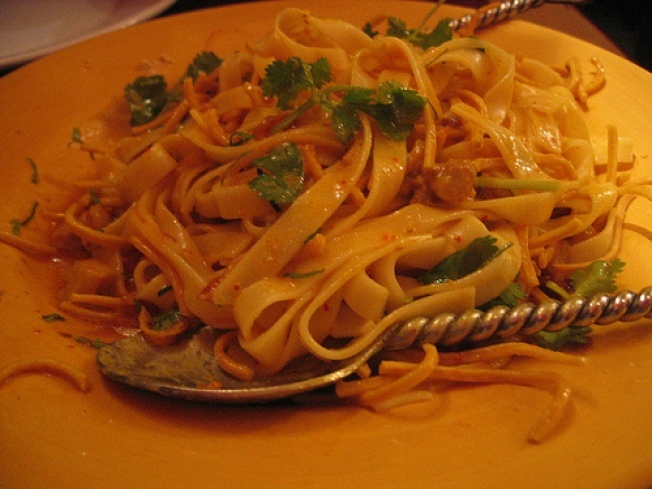 Made of flat noodles, coconut chicken, lime leaves, yellow split pea flour, onions and fried noodles, this dish was a wonderful combination of savory, sour, salty and ever so slightly sweet. Mingalaba offers a menu of classic Chinese dishes as well, but stick with the Burmese specialties here. Although Burmese food has been influenced by the cuisines of China, India and Thailand, it retains its own distinctive identity, particularly in its unique presentation and distinctive ingredients. While Burmese cuisine isn’t as popular yet as I wish it was, Mingalaba is doing a fine job of spreading the word.